Awnings are sheets of fabric or other materials that are supported with a structure made of aluminum, iron, or wood. They can be deployed at the door, window, patio, and in gardens to provide shade. They have numerous applications, which prove beneficial in both, the commercial as well as residential sectors. They add style to homes by improving the architectural design and coloring. Moreover, they help protect the furniture placed outside the house from sun damage. Awnings are available in various types, which include fixed/stationary awning and retractable awning. 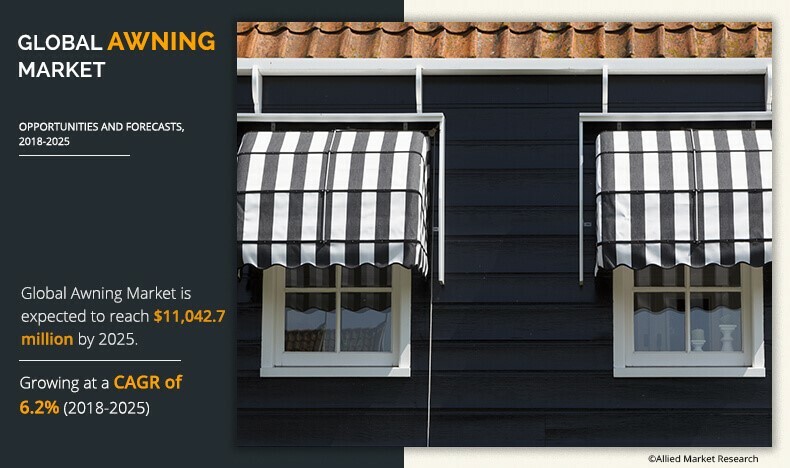 The global awning market was valued at $6,765.8 million in 2017 and is projected to reach $11,042.7 million in 2025, growing at a CAGR of 6.2%. Factors such as expanded living space and sun protection, advances in fabric material, and beautification of the luxurious building drive the growth of the market. In addition, smart awnings with sensors to retract the structure in stormy or rainy weather is expected to propel the growth of the global awning industry. Moreover, fabrics and sheets that are available in different colors and patterns provide numerous opportunities to customers. The global awning market is segmented based on type, product, industry, and region. Based on type, the market is bifurcated into fixed awning and retractable awning. Retractable awning is further sub-segmented into manual and motorized. The retractable awning segment is anticipated to dominate the global awning market throughout the study period. Based on product, the market is categorized into patio, window, freestanding, and others. The industrial segment includes residential, and commercial. The commercial segment is projected to dominate the global awning market in future, due to increase in investments to develop commercial spaces such as shops, hotels, restaurants, sports arena, and theaters. Based on product, the market is segmented into patio, window, freestanding, and others. 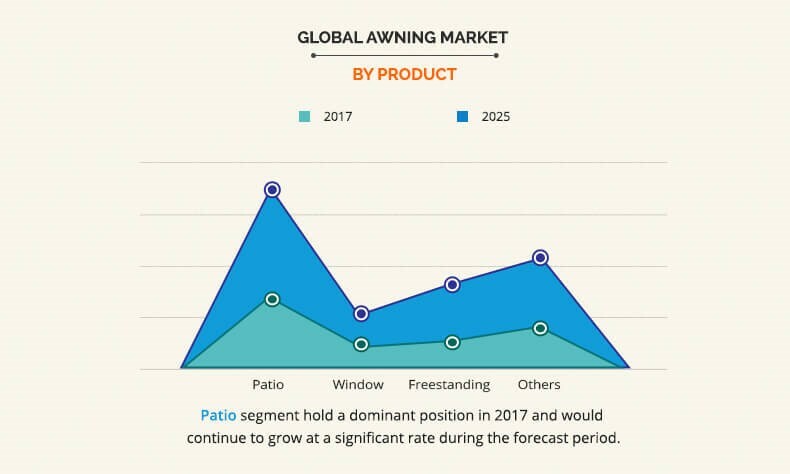 Among these, the patio segment was the highest contributor, and is expected to grow at a significant growth rate during the forecast period, owing to increase in deployment of retractable awning with advanced features in the residential and nonresidential sectors. Use of patio, decks, or veranda is preferred for various occasions such as gathering, lunch, sun bath, and dinners. Moreover, the retractable patio awning with LED lighting is expected to register high growth during the forecast period. The market is analyzed across North America, Europe, Asia-Pacific, and LAMEA. 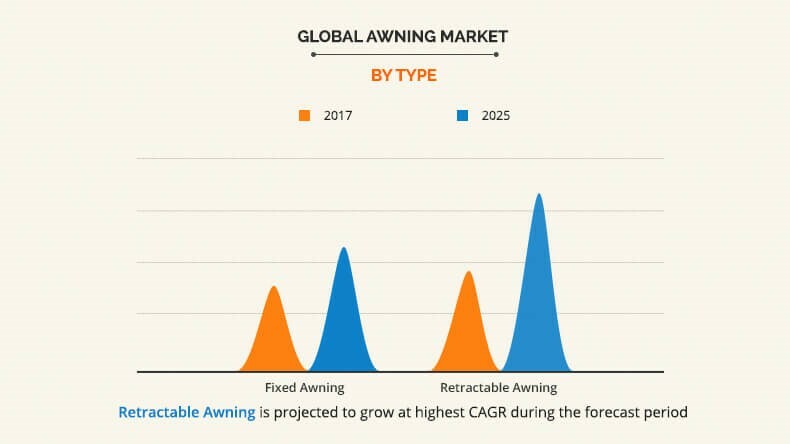 Asia-Pacific holds a significant share in the global awning market and is projected to grow at a high CAGR, due to growth in installation of both, fixed and retractable awning systems in countries such as China, Japan, and India. The study provides an in-depth analysis of the global awning market along with the current trends and future estimations to elucidate the imminent investment pockets. The quantitative analysis of the global awning market from 2017 to 2025 is provided to determine the market potential. 8.2. AWNING COMPANY OF AMERICA, INC.
8.3. CARROLL AWNING CO., INC.
8.5. KE DURASOL AWNINGS INC.
Awnings are devices that offer shade over windows, doors, decks, patios, and walkways. They are a reliable and convenient solution that help expand and make good use of the outdoor spaces. These awnings have been popular since 50 B.C. and were commonly used on American storefronts during the first half of the 19th century. Awnings have changed little over the years; however, introduction of retractable awning has garnered attention of customers. The market has evolved with the availability of various sheathing options such as fabric, plastic, plywood, and glass. Moreover, one can choose from steel, aluminum iron, and wooden frames for awnings. Furthermore, the demand for awnings has increased in commercial and residential sectors, owing to expanded living space and sun protection. Nowadays, retractable awnings can be equipped with devices that are able to sense weather changes. For instance, they can automatically provide shade during a sunny day and retract when it begins to get windy or snowy. This innovation in awnings helps boost the growth of the awning market. Moreover, construction of luxury homes, hotels, and other commercial spaces fuels the demand for awnings globally. Furthermore, freestanding awnings are in great demand owing to their use in outdoor seating, for covering the pool and external restaurant space. Ongoing innovation activities to develop full-cassette awning, and motorized retractable awning further propel the growth of the industry. Emerging economies such as China, Japan, and Middle East and Africa have experienced significant rise in demand for both fixed and retractable awning with increase in applications in residential and commercial sectors. Increase in demand for car parking, poolside, garden, restaurants, hotels, patio, stadium, open theater, and other outdoor areas boosts the growth of the awning market, especially in India. Furthermore, less expensive awning options as compared to concrete shade has accelerated the market growth in developing areas of Africa and Latin America. In addition, emerging economies, such as India, are expected to provide major growth opportunities in commercial and residential sectors. "Awning Market, by Type "